I recently received an email from a mother who just received a diagnosis of Autism for her son. She told me she didn’t have any support from her family but was trying to stay hopeful and was working hard to begin new therapies. I also received a letter from a mother of two boys with Autism. She told me about their struggles and that one of her boys was struggling and lived in a residential facility. The struggles of raising children often come and go, but raising children with special needs can be extremely overwhelming. Our intense struggles with Justin from earlier this year have subsided and we are calmly riding our roller coaster ride of Autism—and we are well!! I love my family and for 6 out of 7 days, my life is adjusted in a way that I think we are pretty normal!! We are happy!! We adjust our goals often and try to stay focused on the positive. So why is it only 6 out of 7?? There is one day a week that always makes me feel like our family is not normal—and that is on Sundays. It is the one day a week I feel a divide in our family. At this point, Justin drops to the floor when we go into church, refusing to move until he bolts to the cultural hall to run around and stare at the lights. My other two toddlers run after him, or the other direction and very quickly we start to unravel at the seams!! It is in these moments, where I am trying so hard to stay positive that a voice in my head frantically says, “This isn’t working, there is no place for your family here—this is not normal.” I share this not as a complaint against any of the wonderful people in our church family—it is just the one day a week that I feel like my testimony of my family and my testimony of attending church meetings don’t correlate!! I recently shared my feelings about this with my sister-in-law after I had gone to a church Christmas party. My husband stayed home with 3 out of our 4 kids and I had a great time saying hello to my friends who are like family to me. But as I watched beautifully made videos of families together at Christmas enjoying traditions—all I could think of is how different it is for my family. I came home to my sweet family and was reminded how much I adore them—with all our differences. But the next day I had to vent to my sister-in-law about my insecurities. She said, “Shannon, you love your family and are happy. Don’t get caught up in wanting a cookie cutter family—this is how your cookie has been cut, and it is wonderful.” I started laughing because she was so right!! As all of us adjust our cookie cutter dreams and expectations may we realize how truly blessed we are just to be children of a Heavenly Father who loves us. He loved us enough to send his only begotten Son to die for our sins so that we can live again with Him. I love my family, and I love my life and the opportunities I have to see beauty and joy in the smallest triumphs!! Watching my kids overcome trials is such a strength to me of the great courage and faith we all can draw upon to keep enduring and pursue our goals of happiness. I hope you all have a Merry Christmas and a Happy New Year!! This picture is from 2 years ago—but it is one of my favorite pictures of my cookie cutter family!! I have been having WAY too much fun designing my own Elder and Sister Missionary stockings!! They have turned out so cute that I have decided to list them in my Etsy shop!! Click here for the link!! He is doing so well now. We aren’t having any head-banging, biting, or screaming fits like he was before. He is back to himself and doing so well in his ABA therapy. We have been working on “Yes” and “No” with Justin and trying to get him to understand what they mean and use them appropriately. He has been saying them in answer to questions for a few months now but just in the last few weeks we started to notice that he was using them accurately almost all the time!! And he is answering “Yes” and “No” questions without us prompting him!! And then about a week ago, we started to get spontaneous sentences from him. Just to be clear—he has said sentences with prompting before, or talked with his iPad, but he is now getting our attention and then requesting things with a full sentence—ON HIS OWN!!! My little man just started talking!! My husband was trying to put him to bed the other night and he walked past him to go downstairs and when asked where he was going, he stopped and said, “I GO DOWNSTAIRS! !” We couldn’t believe it!! And then the sweetest blessing came last night when he looked at my husband and said, “DAD-DY, I WANT PHONE PLEASE.” This was the first time he has said Daddy on his own!! There were tears—tears of great joy. We have been waiting for this answer to prayer for 9 years!! Doctors said it wouldn’t ever come, and others said the costly ABA therapy wasn’t worth it. And after years of Speech therapy, ABA, and many tears—my son is able to talk to us. I am so grateful for the many people who have been put in our path to help Justin along his journey with Autism. Every single one of them has helped in some way to get him to where he is right now. And to the 5 angels who work on his ABA Team right now—Thank you for never giving up, giving us hope, and helping see this dream come true. To all our family and friends—thank you for your prayers, fasting, and endless words of encouragement. My heart grieves for the many sorrows some of you face, for the painful loneliness and wearisome fears you may be experiencing. Nevertheless, I bear witness that our living hope is in Christ Jesus! He is the true, pure, and powerful entrance to divine enlightenment. I couldn’t help but think of this song today as Justin called me Mommy tonight. Yep, I asked him, “Who am I, Justin?” And after repeating me twice he smiled and said, “DADDY” and then doubled over laughing hysterically. He is even teasing us now!! I asked him again and he smiled and said “MOM-MY” and gave me a hug and a kiss goodnight. 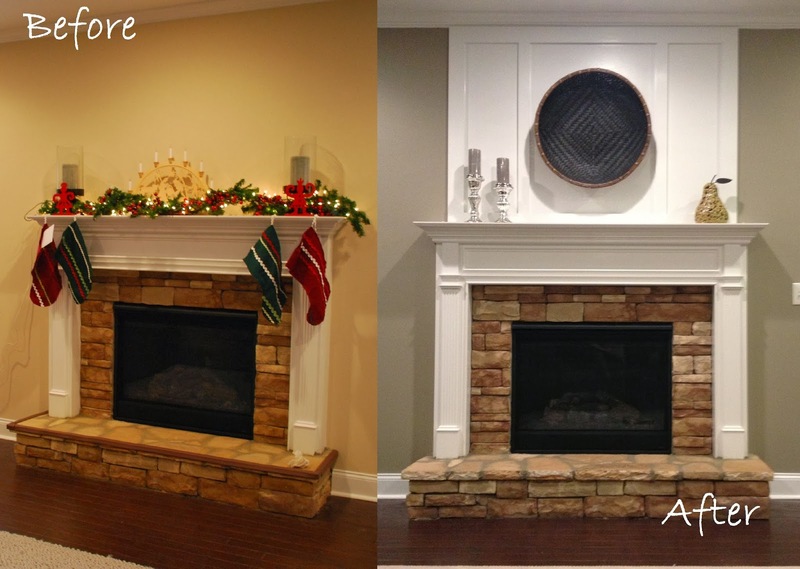 The huge plus is that the rock fireplace is awesome, and the white mantel is beautiful!! But the big downside is it just didn’t have enough of focal point for me on the wall when you walk in the room. It’s a super long room with great recessed lights and two windows on either side, but it was BORING! And the applesauce wall color?? Don’t get me started….that is not my idea of a good neutral color. So I finally found a great paint color from Benjamin Moore called Ashley Gray—it was perfect. I wanted to do some kind of treatment to the wall that would extend to the ceiling to make the room feel taller. I finally settled on a board and batten type look and it turned out just like I wanted it too!! We painted the wall white first, and then added the boards and battens afterwards—filled the nail holes with putty, caulked the seams, and painted it white and VOILA…. The ceiling fan is next to go….but until then, I am just happy with the before and after transformation!! Our church has one Sunday a year where the kids are the focus of the congregation’s main meeting, Sacrament meeting. It is called the Primary Program and it is always full of tender testimonies and beautiful children’s singing and a few spontaneous kid funnies. I have looked forward to this meeting every year, even when I was a kid! Right after Justin got his diagnosis of Autism, when he was almost 4 years old, we moved to a new state in search of better services for him and a better lifestyle for our little family. I remember sitting close to the front row for the Primary Program that year, very excited to hear all the children….and then I looked at one of the mom’s faces as she smiled proudly as her son bravely walked to the pulpit in front of the congregation and said his part. Her tender smile was so touching and then my heart sank as I wondered what our future with Justin would hold, and whether he would ever be able to participate in the Primary Program….or any other things I had dreamed about. I sat for the rest of the meeting paralyzed with my worries and fears and with tears streaming down my face. I felt so scared and alone in our journey with Justin and Autism. Now fast forward 6 years to today. This is not a story of full recovery from Autism or a miracle of Justin speaking spontaneously, but it is the sweetest miracle story I know!! It didn’t start out to be a good day, by any means. Justin woke up mad and had several meltdowns all morning. He tried to undo my husband’s white church shirt which we thought was most certainly a sign that he wanted him to change his clothes and not go take him to church today!! We took all the kids to church anyway and Justin went in to the building, and promptly had a pretty severe meltdown. He started taking off his own clothes(we should have put him in more comfy clothes today—our bad!!) in the foyer and my husband and I looked at each other and agreed—the Primary Program wasn’t happening for him today, and that was okay!! He had made it through two practices already. And I am always in awe at the spirit of love I can feel from all the kids in Primary and their leaders when Justin is around. At one of the practices, they waited for him to come in from the hallway and when he entered the room and walked up to the pulpit—there was complete silence. Not an awkward silence, but the silence of anticipation of something great. I felt like every kid was holding their breath and thinking, “You can do it Justin!” That triumphant, supportive spirit is something I know that Justin can feel. And my husband prompted him word for word through his part. And as soon as he finished, everyone sighed with a smile of pride—their Justin did it!! Once we realized Justin wasn’t going to make it, my husband took him to the car to watch a movie while I stayed to hear my daughter. Justin had the first line of the program, and as the time got closer I decided to go to the car and see if he wanted to give it a try. My husband told me he had already tried to bring him back into the building, and he melted again!! I got his attention and asked him if he wanted to say his part in the microphone. He looked at me and said, “Yes.” So we decided it wouldn’t hurt to try it again. We anxiously waited outside the chapel doors and then as soon as all the other Primary children were seated we motioned for Justin to come to the doors. He ran the other direction and squealed. My husband went over and picked him up and he started laughing. That’s when we knew this might actually work out. He carried him through the doors to the chapel and directly onto the stand and then he walked up to the pulpit and being prompted by my husband word for word said his part into the microphone, “I-KNOW-THAT-I-AM-A-CHILD-OF-GOD.” And then he smiled, and walked out of the chapel. He didn’t smile for a picture because he was too busy eating his Swedish Fish as a reward—he deserved it!! I am always so proud of Justin for how hard he tries every day to combat so many obstacles that challenge him. He is such a great example to me and shows me such great determination. I know that he knows he is a child of God. He is not any less of a child of God than anyone else on this Earth. It is such a simple phrase, but it completely puts into perspective why we are here in this life and reminds me that our day-to-day challenges are so temporal. I am so grateful for that pristine moment of clarity today from hearing Justin’s testimony. I love you with all my heart buddy! !